Giving is a wonderful thing isn’t it? Well, it IS, til it’s not. We’ve been bombarded with messages our whole lives about the wonderful magic and giving. There is a lot that we could unpack about giving and receiving isn’t there? Much of which ends up leading us along the path to discover more about our own inner belief system and I completely encourage that. However, today I want to focus on one area. The Shadow side of giving. And no, I’m not talking today about the idea of ‘over-giving’ although the underlying reasons we do that might be here. I’m talking about how the concept of giving could be a less than savory ideal. When we give openly and from a truly loving heart, then there really is little down side to giving. The problem is we quite often are not able to fully do this. Pro tip: If you have trouble receiving, you probably are not fully and openly giving. Those two are always hand in hand. In fact, we quite often (read usually) have our agendas and conditions right there with our giving. They may be hidden ones, riding right under the surface. They might even be hidden so well that we ourselves can ignore them and pretend, at least for a while, that they don’t exist. But they do. And they are influencing and creating shadows within your otherwise loving gesture of generosity. You see, by it’s very nature giving can set up expectations that go unfulfilled. This is a huge issue in many relationships! One person feels like they are giving and giving and getting nothing in return because they had an expectation that the energy/time/effort would be returned in kind and appreciation sent their way. It doesn’t work like that. You know this logically but can you think of places you ‘sorta-kinda’ do have that expectation? Work? Spouse? Kids? Neighbor? Parents? Yeah, don’t feel bad. We all do it. Still, we are setting up a perfect storm of resentment and frustration when our often unexpressed expectations are not met. The other bit of shadow work we can do around giving is for both the giver and the receiver. It’s time to look honestly and openly at the power shift that giving creates. Listen, it’s just part of the deal. The giver can have a LOT of power over the receiver at times – at any rate, there is always a little bit of a power shift…albeit one we can easily pretend doesn’t exist. When we give with no strings, no obligation and no expectation from a truly loving place – this power shift becomes irrelevant and has little or no impact. However, we rarely do and so many of us can rarely receive without feeling like we just had to give up a little bit (or a lot) of our own power. Consider the wealthy parent who holds the purse strings tight and the children who wait, feeling totally un-empowered in their own lives for the wealth to eventually come to them. Or the father who is the wage earner and works hard for his family so feels it’s his job/right to decide how the family spends it’s down time and vacations and so his wife and children feel dis-empowered, unimportant and obligated to do ‘his’ thing. Or the lovely woman who gives gifts to her co-workers at holiday time and now some of her peers are worried she is expecting gifts as well and they can’t really afford it. You see? A power shift can be quiet and often sneak in there. The trouble for this belongs to both the giver and the receivers however. It’s important that, even it there are expectations and strings, a person on the receiving end of a ‘gift’ of any kind ensures they stand in their own light and hold onto their personal power. Remember, someone else’s expectations of you – voiced or not – only become yours when you accept them. Only YOU can give up control over your own life! 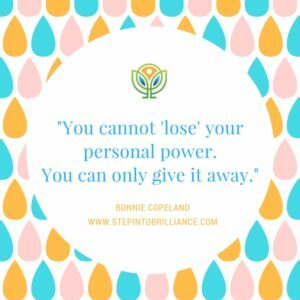 You cannot lose your power, you can only give it away. For those who love to give and gift – I commend you. It really is a lovely trait, most of the time. But I encourage you to examine your why’s and your underlying emotions around your giving. I just imagine a world where giving and receiving have only love attached to them, because the truth is there can BE no open and loving giving without in turn a loving and open receiver. It’s another of life’s beautiful circles. When doing this deep dive into your own truth, there is not a single drop of judgment needed. Discernment – yes! Judgment – no. We do not need to worry about yesterday when we are learning. We only need to desire to be and do better than we have done in the past. And that lovely, it totally doable! P.S. For those of you who weren’t able to make my live workshop – Thrive During Change is now available online! Check it out!